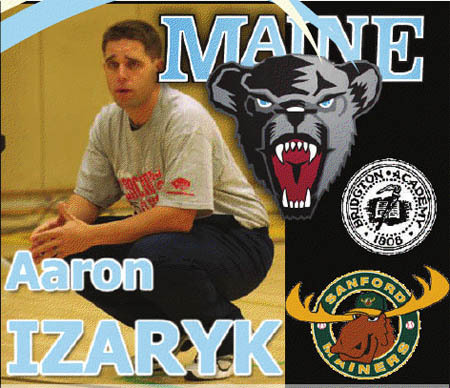 Aaron Izaryk spent nine seasons at the University of Maine as a player and assistant coach. He spent the last two seasons as head coach of the Sanford Mariners in the New England Collegiate Baseball League, and was recently named head coach at Brighton Academy. Izaryk served as a full-time assistant and pitching coach, and catcher instructor for the University of Maine and in the Summer of 2006 was an assistant coach for the Keene Swamp Bats on the NECBL. Izaryk also served as an assistant coach with the Hyannis Mets of the Cape Cod league in 2007. Izaryk is one of the top young baseball minds in the country and brings an enthusiasm and energy for the game that is truly contagious. At this VBCA Clinic Izaryk will speak on the fundamentals and drills for catching, pitching, infield, base running, hitting, and outfield play designed to help coaches better prepare athletes for the fundamental execution necessary for baseball success. Izaaryk will then hold a FREE 1 hour seminar on playing college baseball and what coaches, parents, and players need to know about the recruiting process. Please speed the word that all players and parents are welcome to attend. Izaryk will highlight the NCAA Clearinghouse and various showcase style camps around New England. This information session will be very beneficial for any players looking to the next level of competition after high school. "What you need to know." This presentation is for all coaches, parents, and high school players who have an interest in playing baseball beyond high school. Learn about recruiting, the NCAA Clearinghouse, Showcases, and everything you need to know about playing baseball at the next level.